Hosting the biggest Oscars night party in DC for the last few years has given me a pretty good perspective on what's working and what isn't. Last night, Jimmy Kimmel took another swing at hosting and once again he was fairly well-received, with his jabs at Harvey Weinstein, Donald Trump, and Mike Pence going over with the Hollywood crowd, as we knew they would. And his extended night-long bit about the jet ski...well, at least it had a great payoff. Of course, given the current political climate this was going to be a night of speeches that emphasized diversity and inclusion. 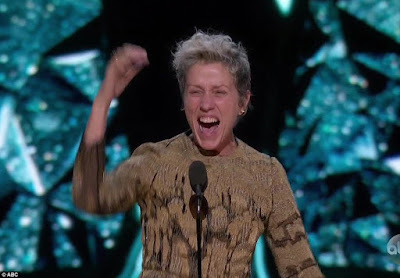 Of these, I think the highlight would have to be Best Actress winner Frances McDormand, who took her time at the mic to put her Oscar down and give all of the female nominees and winners a moment a shine. It was a powerful moment, which McDormand used as a call to action, asking everybody in the room to start demanding an "inclusion rider" in their upcoming deals. Basically, demand diversity in every project or nothing moves forward. There were other touching speeches that were more meat and potatoes, but still heartfelt. Sam Rockwell used his Best Actor win to talk about his love of movies and say a final word to his late pal, Philip Seymour Hoffman. Guillermo Del Toro talked about growing up a movie fan in Mexico, and worrying that where he was born would prevent him from ever having a career. Gary Oldman, who finally got the Oscar I think we've all wanted for him for so long, reminded us how soft-spoken he is. And Allison Janney took all the credit for her Best Supporting Actress win for herself, jokingly of course. The most laughs of the night, though? They went to two of the most hilarious women anywhere, Tiffany Haddish and Maya Rudolph, who eased our minds that the Oscars aren't becoming "too black" now, and that there are plenty more white people around still runnin' things.